For use with all Bb, Eb, Bass Clef, and C instruments, the Hal Leonard Blues Play-Along Series is the ultimate jamming tool for all blues musicians. With authentic, easy-to-read lead sheets, and other split-track choices on the included CD, these first-of-a-kind packages will bring your local blues jam right into your house! Each professionally recorded song on the CD includes two tracks: a full-stereo mix, and a split track mix with removable guitar, bass, piano, and horn parts. The CD is playable on any CD player, and also enhanced so Mac & PC users can adjust the recording to any tempo without changing the pitch! 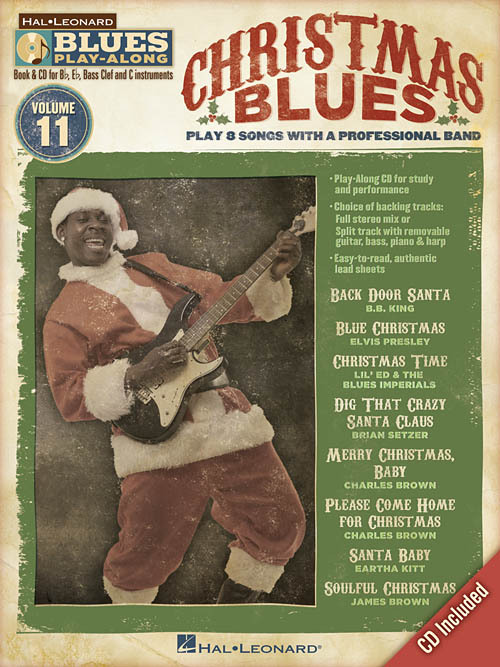 Features 8 holiday songs: Back Door Santa • Blue Christmas • Christmas Time • Dig That Crazy Santa Claus • Merry Christmas, Baby • Please Come Home for Christmas • Santa Baby • Soulful Christmas.